The purpose of a monitoring visit (sometimes called a supervision visit or a field visit) is to make sure that project activities are implemented the way they are described in the plan. It normally involves meeting with the people running the project, meeting with the participants, and observing the activities. At the end of a monitoring visit, it is important to prepare a report that describes what you found. These reports will document any discrepancies between the plan and actual implementation, as well as improvements made by the project team. You need to report the results of a monitoring visit, supervision visit, or field visit. 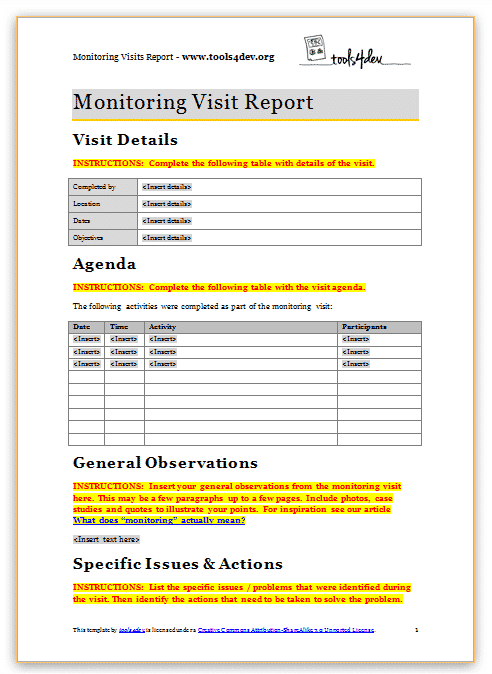 Your organisation or donor already has a standard template for monitoring visit reports (in which case use their template). 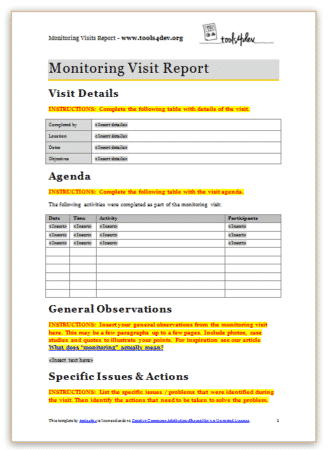 The Monitoring Visit Report Template by tools4dev is licensed under a Creative Commons Attribution-ShareAlike 3.0 Unported License. All other content is © tools4dev.